M-Sport Poland has unveiled the all-new EcoBoost-powered Ford Fiesta R2 – the first car designed to the FIA’s latest R2 regulations, and the first car to be fully designed and developed at the team’s state-of-the-art facilities in Krakow. Based on the road-going Ford Fiesta ST-Line which is manufactured at Ford’s Cologne facility, M-Sport Poland has worked in conjunction with the Ford Motor Company who provided significant financial backing for the programme. The development of the latest edition of the Fiesta R2 extends the partnership of both companies in maintaining an effective ‘Ladder of Opportunity’ and the new R2 retains a strong pedigree – sharing its platform with one of the world’s best-selling small cars. As one of the first rungs on the Ladder, the Fiesta R2 has spent the past 10 years launching the careers of some of rallying’s most popular names – Ott Tänak, Elfyn Evans, Craig Breen and Pontus Tidemand all spending time and honing their skills behind the wheel of the little Fiesta. Despite a complete redesign, the all-new Fiesta maintains the same philosophy and will form the basis for next year’s FIA Junior WRC Championship – continuing M-Sport and Ford’s commitment to supporting the sport’s future stars. 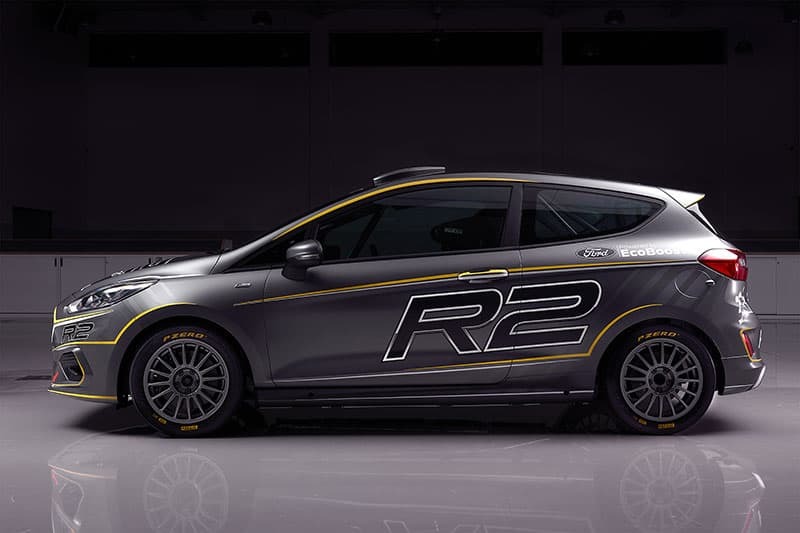 Designed from a completely clean sheet of paper, the new Fiesta R2 shares little with its predecessor and the team were inspired by the championship-winning Ford Fiesta WRC and its design. Engine performance has been significantly improved, as have the transmission and suspension. In fact every element has been rethought and improved to produce a car that performs to M-Sport Poland’s exacting standards. The turbo charged 999cc Ford EcoBoost engine delivers 200 HP at 6,500 RPM and the new Sadev five-speed sequential gearbox can be adjusted across three different ramps. The new suspension includes Reiger dampers which are three-way adjustable on the front and two-way adjustable on the rear. Eibach springs compliment with the option of hard or soft, and there is also an optional anti-roll bar to further enhance the set-up options. “The all-new Ford Fiesta R2 is a massive step forward and something everyone at M-Sport Poland is extremely proud of. It’s the first car to be fully designed and developed here in Krakow, and a tremendous amount of effort, passion and enthusiasm has gone into making this project as successful as possible. “Sharing information with the engineers and designers back in Cumbria, we’ve been inspired by the success of the championship-winning Ford Fiesta WRC and every component has been designed to make this new car as strong and as innovative as possible within the regulations. Turbo Charged 999cc Ford EcoBoost Technology. 12 valve, 3 cylinders in line. Alloy head & Iron block. New Sadev five speed sequential gearbox with plated limited slip differential. Electronic detent control. 3 possible set up of differential ramps (23/57) (27/57) (32/77). AP Racing two disc plate clutch. New Reiger adjustable dampers with Eibach springs. Front 3-way, rear 2-way adjustable. Optional springs (Hard/Soft). Optional anti-roll bar (Hard/Soft). Alcon competition calipers. Ventilated AP Racing front discs (Gravel 285mm, Tarmac 310mm). Rear Alcon solid discs 280mm. Hydraulic handbrake with Alcon master cylinder. Electric power assisted steering, column mounted.